Down will be firm underdogs when they take on McKenna Cup winners Tyrone in their opening Division One game in the National League on Saturday. It is a tough one to start for sure, but the problem is they will not get any easier. That is the verdict of Down's star forward Benny Coulter as he surveys the quality of the teams now occupying the league's top flight. 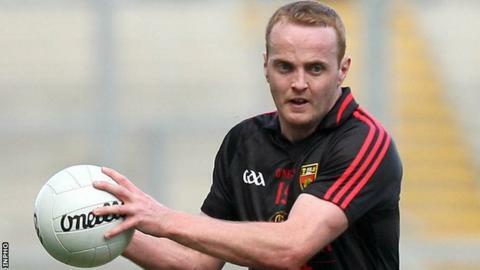 After Tyrone, Down face All-Ireland champions Donegal, then Cork, Mayo, Kerry, Dublin, Kildare. Pick an easy one out of that lot. "Yes, I would say we are the number eight team in the division," Coulter responds. "That is certainly the way the bookies have it. "It is daunting but hopefully we can scrape something, somewhere along the line and survive in Division One." Survival - that word passed the lips of several interviewees at Down's recent media night in the run-up to the league campaign. It is almost as if the damage limitation has started already. Manager James McCartan, with some new young players being drafted in, dismisses any notion that they might be targeting a place in the end-of-season play-offs. Survival is the objective, he confirms, knowing that he will be without established stars Ambrose Rogers, Danny Hughes and Dan Gordon for the most of the campaign. Interestingly, Coulter considers building a team for Championship battle the top priority for the Mourne county. This year's Division One looks particularly competitive. It is packed with quality teams and I am looking forward to some cracking games. So join me on Radio Ulster medium wave on Saturday for two mouth-watering games. First up is the clash between All-Ireland winners Donegal and Kieran McGeeney's Kildare at Croke Park, followed by Down v Tyrone at Pairc Esler. "If we don't survive in this division, it is not the end of the world," said Coulter, an All Star winner in 2010. "We are trying to build a good team and, if it means getting relegated, it means getting relegated." Tyrone will be fancied to get the points in Saturday's Newry opener, and Coulter quickly points to the emphatic manner in which they saw off their five opponents in retaining the McKenna Cup. Red Hands manager Mickey Harte treads carefully on the issue of current form, wary of his team's prospects being build up too much. "It is January, teams are experimenting, and they do not have their full teams out," said the three-times All-Ireland winning boss. "When the league comes along, it is a different ball game. "It is a home game for Down and we must not allow the joy of winning the McKenna Cup to take away our focus from the match against Down. "It is a pretty competitive division. All the teams who have been successful in the last four or five are there now. "Everyone who is in it will be fighting to stay in it - there will be no gifts given out."